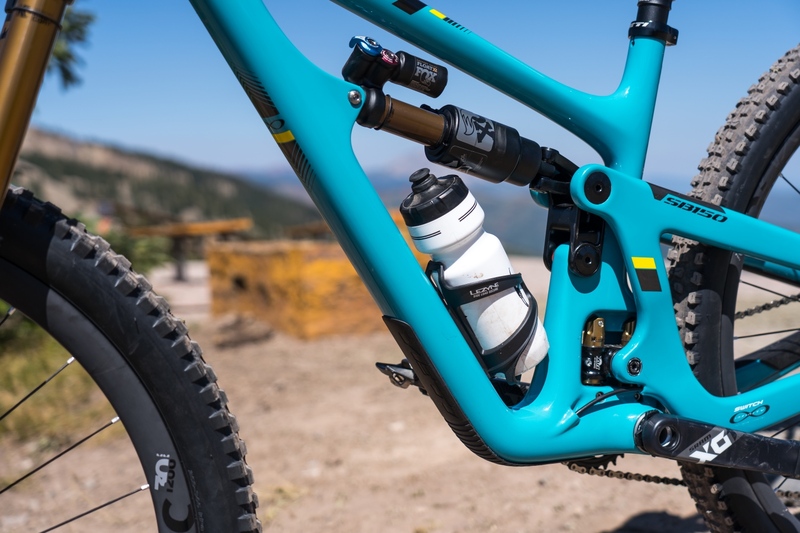 The Yeti SB150 is the Golden, Colorado-based bike maker’s latest enduro-shred ready machine that attempts to address any shortcomings of its previous longer travel bikes (read: primarily space for a water bottle). It does this while maintaining top end performance of its highly regarded Switch Infinity suspension system that has superb pedaling platform — and does a great job of soaking up the rough stuff. 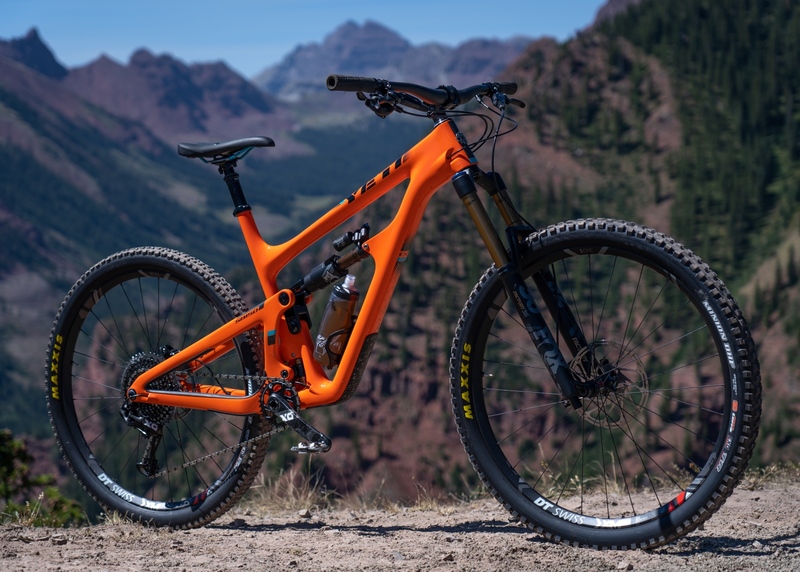 Key metrics of this 29er rock pulverizer are 150mm rear travel, 170mm front, 64.5-degree head angle, 76.9 effective seat tube angle, 433mm chainstays, 44mm fork offset (versus the traditional 51mm), 480.2mm reach/815mm front center, and 1248mm wheelbase (all size large). 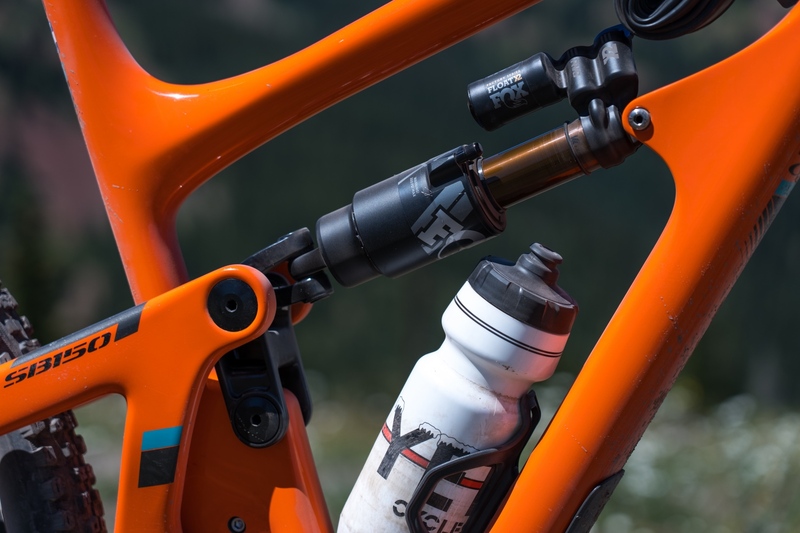 And yes, you can fit a full size water bottle inside the main triangle of the high modulus carbon frame that’s been tested to more rigorous downhill standards. Check out Mtbr’s Yeti SB150 first look for deep dive on this bike’s development. 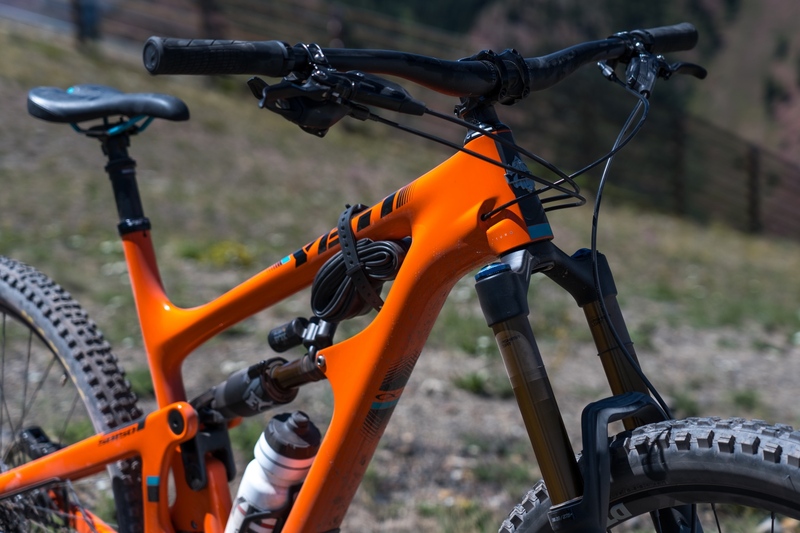 The new Yeti SB150 will come in two colors (orange or turquoise) and two carbon frame options, C Series and the more expensive Turq, which shaves 200-300 grams depending on frame size. A Turq frame only runs $3800. The two C Series builds are $5199 (SRAM GX Eagle) and $6199 (GX Eagle Comp). Price for the Turq complete bikes are $7599 (SRAM XO1 Eagle), $8599 (SRAM XO1 Eagle Race), and $9499 (SRAM XX1 Eagle). 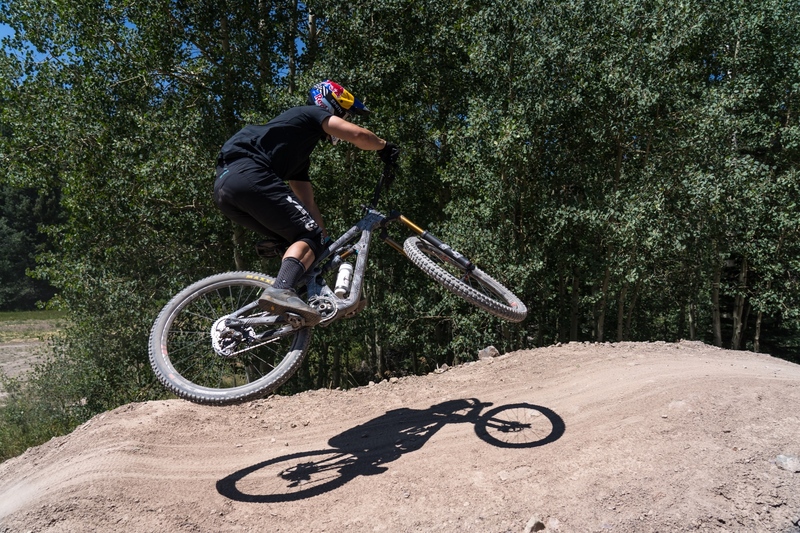 Mtbr spent about a month testing a SRAM XO1 Eagle Race build on everything from mellow XC-style singletrack, to legit backcountry chunk, to the expert-rated bike park trails at both Aspen-Snowmass and our home hill, Crested Butte Mountain Resort’s Evolution Bike Park. 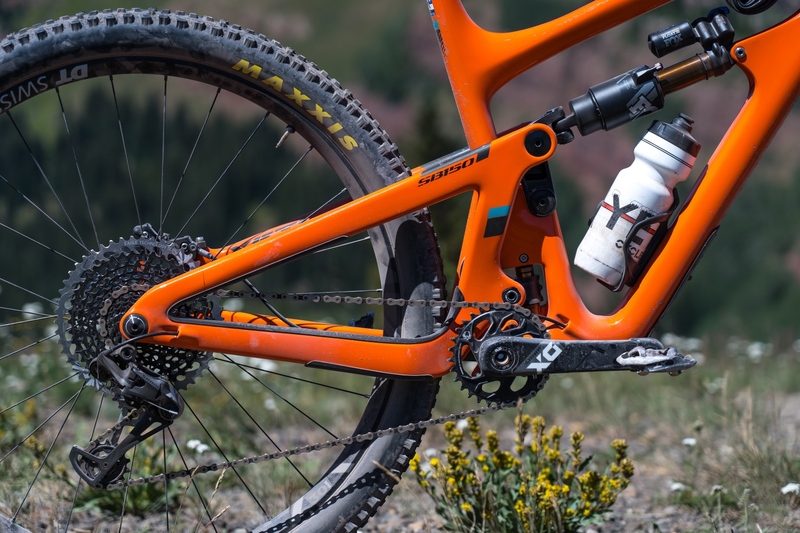 Our size XL tester Yeti SB150 weighed a modest 30.6 pounds, and featured the highly adjustable Fox Float X2 shock, 170mm Fox Factory 36 fork with Grip2 damper, SRAM Code RSC brakes, DT Swiss XM 1501 Spline One aluminum wheels with 30mm inner rim width, Maxxis Aggressor 2.3 (rear) and Minion DHF 2.5 (front) tires, 800mm carbon Yeti-branded bars and 40mm Race Face Aeffect stem, and a 150mm travel internally routed Fox Transfer dropper post. Keep reading to hear our thoughts after this short term test. The reward for climbing the Green Lake trail are views like this — and a rowdy descent back down. 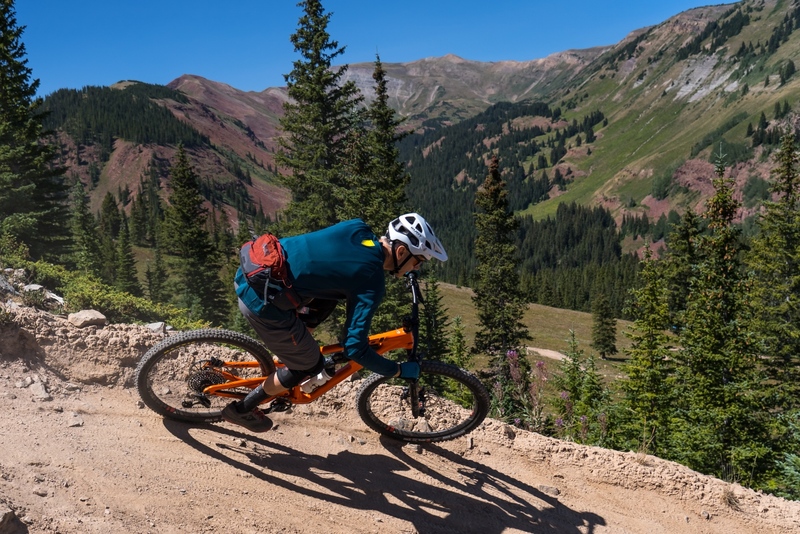 On the south edge of Crested Butte resides the Green Lake trail, a roughly 8-mile up-and-back that climbs around 1700 feet, topping out above 10,500 feet at a stunningly scenic high alpine lake. The trip up is a lung busting affair, with numerous precipitously steep and chunky sections interspersed between ribbons of smooth singletrack. I’ve never cleared the whole thing, always either dabbing on one of the tricky uphill grunts — or simply being overcome by lactic acid. But when you reach the top, you get the pleasure of soaking in some amazing Colorado high country scenery, and then ripping one of the area’s best rowdy descents that’s a mix of teeth rattling chunk, quick bermy turns, and numerous full-throttle braided sections where bravery is the lone speed limiter. It’s a great trail for testing bikes. 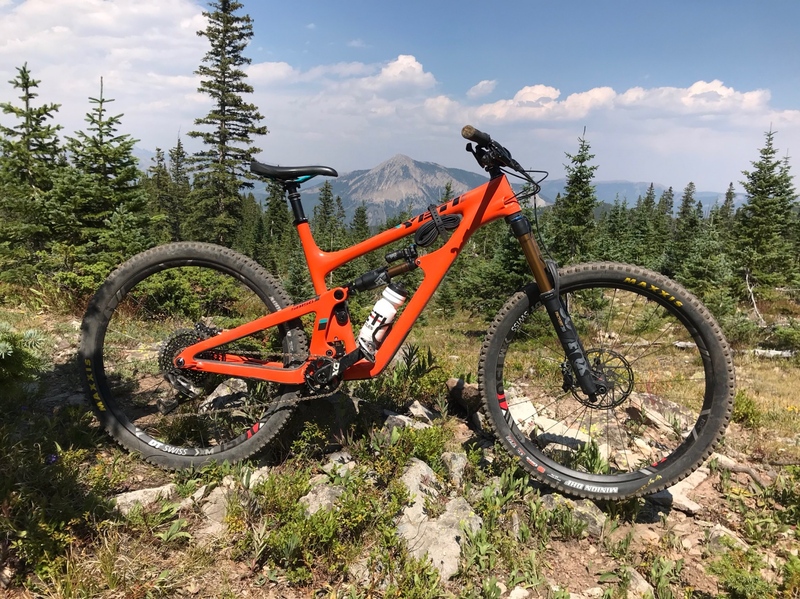 So after getting one long day in and around the Aspen-Snowmass bike park at initial launch of the Yeti SB150, I drove home to Crested Butte with a size XL test bike (I’m 6-4, 170 pounds) and soon after headed to the Green Lake trail. From the first pedal stroke, the trip up was a revelation. 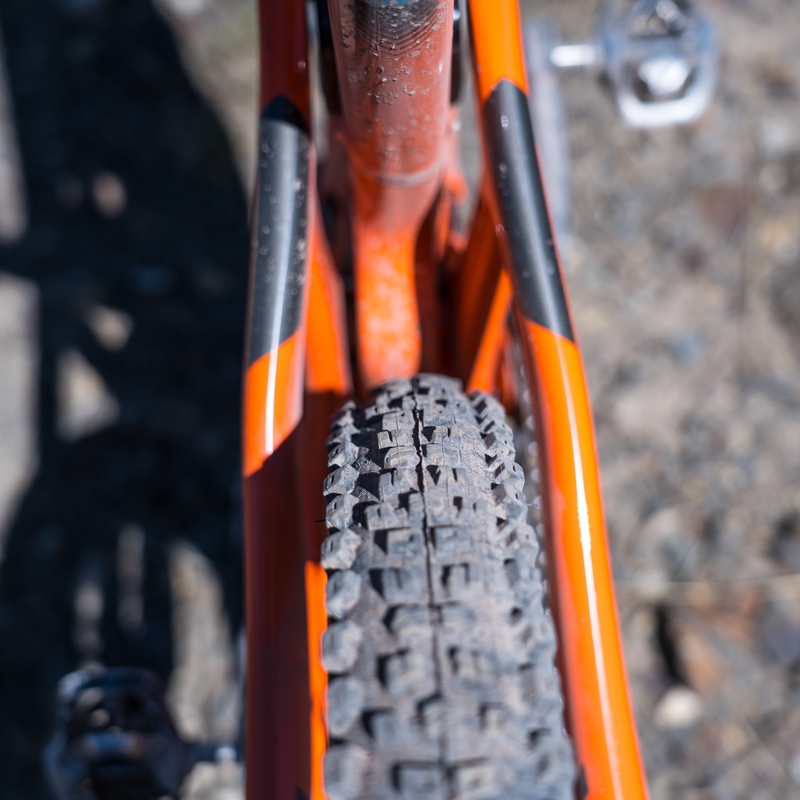 The idea that a bike with 150mm/170mm of front/rear travel and a 64.5-degree head angle could navigate the tricky climbing sections of this trail seemed preposterous. But it’s amazing what a near 77-degree seat tube angle, 40mm stem, and stable pedaling platform delivers. No, I didn’t clear the whole thing during any of my three Green Lake-Yeti SB150 test sessions. But even with limited bike familiarity, I was able to plow up some of the trickiest sections, where roots, rocks, and holes collectively conspire to grab your front wheel and stall momentum. Instead, as long as you can keep the power churning, the Yeti SB150 just keeps rolling — up and over, up and over, up and over. And there’s no hunting and pecking required to keep the front wheel aimed in the right direction, further tribute to the steep seat tube angle along with the bike’s shorter 44mm fork offset, which brings the front wheel rearward helping enhance traction while climbing or descending. One potential knock, and it’s a long one, is the Yeti SB150’s wheelbase, which for the XL frame is a rangy 1278mm. 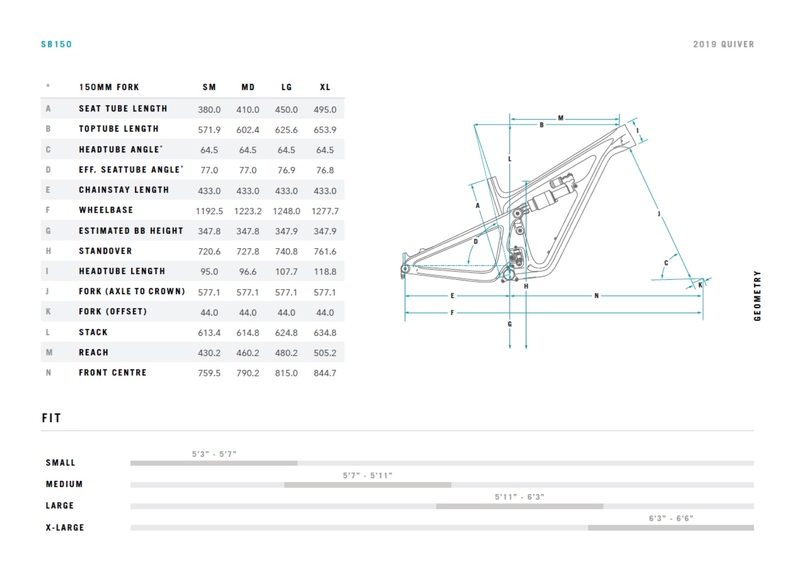 Compare that to XL versions of the outgoing Yeti SB5.5 (1221mm), Santa Cruz Hightower LT (1223mm), and Ibis Ripmo (1249mm), and you get a sense of where the Yeti SB150 lands. It’s more closely in line with the Transition Sentinel (another long travel 29er trail hammer) that in size XL has a 1277mm wheelbase along with a 64-degree head angle and 43mm fork offset. And I’m not gonna lie, the Yeti SB150 was not my favorite bike when trying to negotiate tight switchbacks going up or down. You really have to be precise in your line choice, and even when I was on point I still sometimes found myself running out of real estate on trickier reversals. But that’s more than enough blabber about climbing, because no one is going to buy this bike in pursuit of Strava KoMs. Not the uphill ones, anyway. 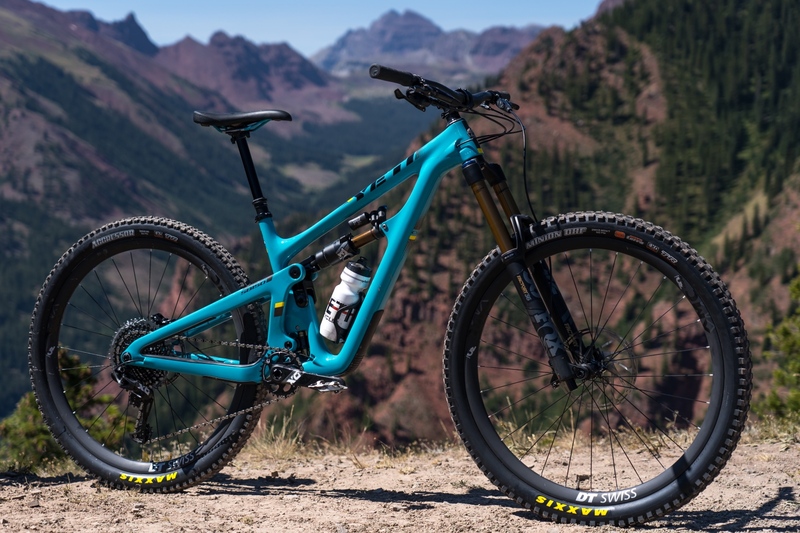 What the Yeti SB150 is is a burly long travel 29er that won’t make you hate life every time the trail turns skyward — and could capably serve as your one and only bike, so long as you view climbing primarily as a way to reduce your carbon shuttle driving footprint. It certainly won’t slow down primary benefactor, Yeti Factory Team rider Richie Rude, who’ll be piloting this bike on the Enduro World Series circuit the rest of the year, and has already tasted victory, winning the California Enduro Series stop at Northstar aboard a masked Yeti SB150 that’s pictured below along with the complete geo chart. Click the images to enlarge. My first trip down the Green Lake trail on the Yeti SB150 was interesting. While the bike felt ridiculously fast anytime the trail straightened, chomping through rocky terrain and blasting over roots with truly reckless abandon, I found myself occasionally late initiating turns, a fact attributable to the slack head angle and shorter fork offset, which increases trail and can result in the need more steering input than I’m used to. During ensuing rides on Green Lake and elsewhere, I adjusted my approach, settling body weight into a more center-forward position, chin perched above stem, front wheel weighted, elbows cocked wide. 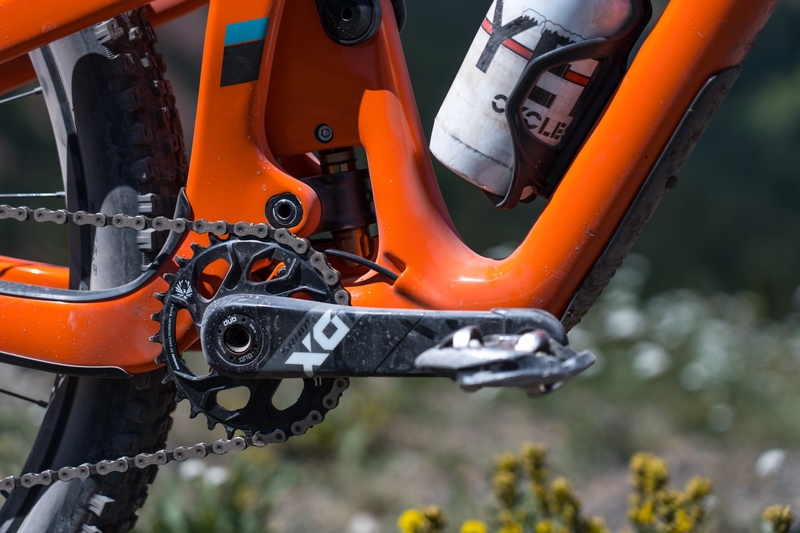 This allowed the Yeti SB150’s true beastly intentions to emerge, continuing the churn through chunder, but also allowing for more precision when changing direction. And while I’d hesitate to call the Yeti SB150 playful, it’s certainly not a plodding battleship. It does, however, demand that its pilot ride aggressively. Hang out in the rear, and this bike can get away from you like a wild horse recognizing a timid rider at its reigns. But get into that proper forward-leaning attack position and there’s not much this bike can’t handle. As my comfort level grew, I found myself intentionally taking “bad” lines just to see if I could make the Yeti SB150 flinch. It didn’t, instead simply picking up speed while maintaining composure and stability. Indeed, the best line on this bike will invariably be the one that’s straight from A-to-B. No need to bob or weave. Just go straight through whatever stands in your way. And even when my mind told me I was slower on a particular section of trail, post-ride GPS data downloads told a different story. Without even really trying I posted a handful of downhill PRs on Trails such as Green Lake and Doctor Park. Bottom line, the Yeti SB150 is a big bad beast of a bike that can handle just about anything this side of a World Cup downhill — and actually climbs really damn well, too. Yes, the wheelbase is long. And yes, even the $8599 build is no flyweight. But if your goal is simply to go as fast as possible, and you’re not afraid to ride at the ragged edge, keeping the front tire fully loaded at all costs, then this bike belongs on your shopping short list. The extended reach (505.2mm versus 463mm on the SB5.5) creates an incredibly roomy cockpit, and the bike’s Switch Infinity suspension platform has excellent anti-squat for stable pedaling performance, exceptionally solid mid-stroke support, and still maintains the bottomless and plush feel that made its predecessors such huge hits. Toss in space for a water bottle, and there’s very little to grumble about. I appreciate the clarity on the bike’s climbing prowess on switchback climbs. Cool bike, but realistically not the one for me. Regarding your Pro statement, “Clearance for some 2.5 tires (though it may be tight in rear so measure first)”: As shops rarely display all tire brands and models inflated on wheels and actual inflated tire size typically varies between brands and rim width, measuring first would not be an option for most buyers. What specific tire/rim combination was used in Yeti’s 2.5 fit calculation? Your article says that “initially a 150mm dropper is max spec” Is there a plan to change that? 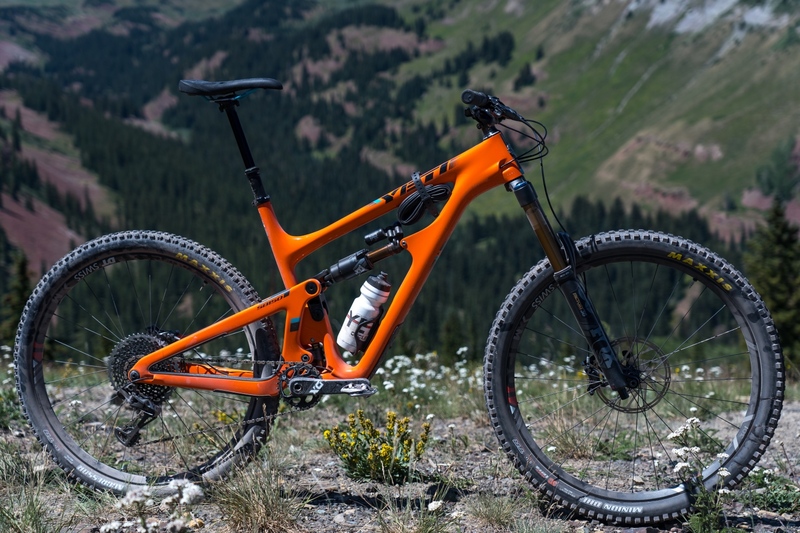 and being 6’4″ as well how did you feel about a 150mm dropper? I’d imagine you probably have at least a 170 mm on your own bike. All depends on Fox, which is maker of the stock post on these bikes and currently doesnt offer anything longer than 150mm travel. Yeti said when that changes they will change spec. As for being tall and using a 150mm dropper, it really wasnt that big a deal the vast majority of time, though you are correct that on personal bikes I have a 170mm. Hey so pulled the trigger on that frame and built it up with a 185mm Bike yoke dropper post. Could probably get a 200mm 9point8 in there as well.